This week my colleague Ken Goldstein and I conducted a Wisconsin statewide survey sponsored by the UW Department of Political Science and WisPolitics.com. So fair warning that I'm a party to this survey rather than an independent observer. A number of people have commented on the party identification balance in the survey: 38% Dem, 24% Rep, 29% Independent (37% Independent when "no preference/other" are allocated to independent. When this group is asked how they "lean", very few insist on some other party, so this allocation makes sense.) See Alan Reifman's blog on weighting and party id for a good example and discussion of broader issues of weighting to party id. I want to point out two things here and put our data in the context of other polls in Wisconsin. The chart above shows party identification trends since 2000 using data from three sources that have done frequent polling in the state. What we see is a relatively stable Dem/Rep parity from 2000-2004, with Dem ID falling a bit around 2004 while Reps moved up slightly. We did not weight our survey to party identification, and these trends help explain why we have reservations about doing that. While relatively stable, party id does move over time, and by a fair bit, as you can see here. But that said, our unweighted results turn out to be quite close to the estimated trends in partisan categories in any case. The second point is to compare these trends with those in exit poll measures of party id. In 2000, the VNS Exit poll put Wisconsin pid at 37% Dem, 32% Rep and 31% Ind. This shifted in 2004 to 35% Dem, 27% Ind and 38% Rep. But in 2006 the exit polls found that the balance was 38% Dem, 34% Rep and 27% Ind. Those values all show a smaller share of independents at the polls on election day compared to the polling trend, but that is to be expected given differences in turnout between partisans and independents. The size of the party ID groups grows as a result, but the balance between them is in line with what we see in the trends in the polls, though certainly not an exact match. The polls, after all, are of either adults or likely voters, while the exits are by definition a measure of who actually showed up on election day. For 2006, the Dem exit percent and the Dem trend estimate are a close match. Republicans gain in the exits, by about 6 points over the 2006 trend estimate. If that holds for 2008, we might expect an electorate more like 38% Dem and 30% Rep. Of course both parties will have very active "ground games" and GOTV efforts to try to change those numbers. 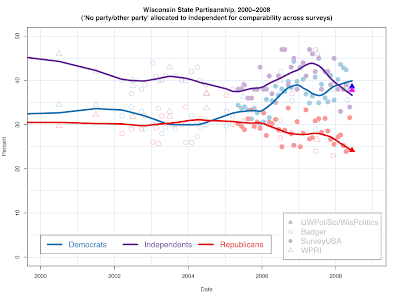 While I'm certainly happy that our party id balance is so close to the trend in all the other polling, the more important point is that party id in Wisconsin has shifted quite a bit over the past four years. The coming campaign may alter that, possibly bringing disappointed former Republicans back home, for example. Likewise a Republican advantage in turnout could bring the exit polls back to closer balance. But as the data show, today the GOP is at the worst disadvantage the state has seen in over eight years. Let me conclude with a bit of description of the polls used here. Wisconsin Policy Research Institute ("WPRI") has done some of the longest running polls in the state, usually two a year. Their data here is taken from their annual estimates, which I assume pool the two surveys though they don't say so explicitly. WPRI describes itself as "Wisconsin's Free Market Think Tank". The "Badger Poll" is conducted by the UW Survey Center. They did more extensive polling in 2002-04 but now do about two polls a year. SurveyUSA is a well known national pollster that uses "Interactive Voice Response" (IVR) automated interviews. SurveyUSA has done monthly polling in the state since 2005, providing some of the best data on state trends in approval of elected officials and as a byproduct have an excellent data series of party ID. Finally, there is our new Department of Political Science/WisPolitics poll. Ours uses a commercial call center, not the UW Survey Center or undergrads in a class calling for a grade. WPRI, Badger and our poll all use live interviewers, SurveyUSA uses IVR. Most of these surveys are in the 500-600 respondent range.